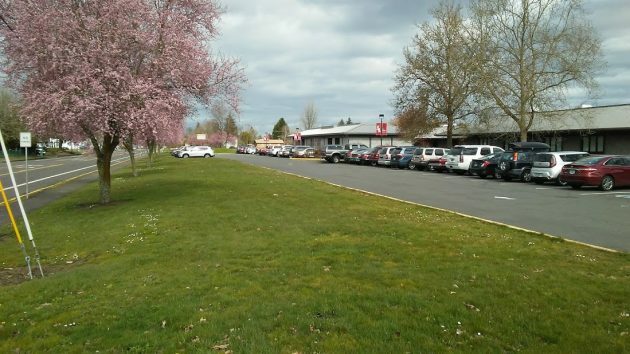 Outside the front entrance at South Albany High School at mid-day on Friday. 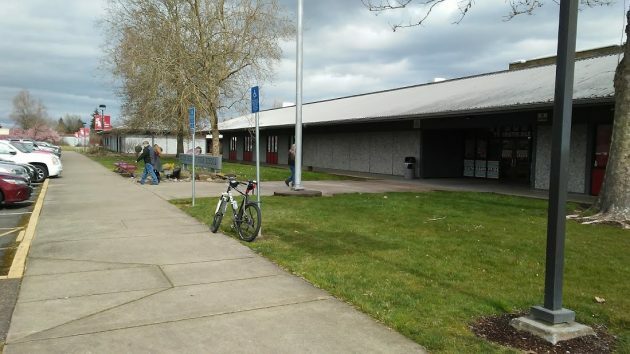 When they’re finished with renovations that include various 8-foot-tall fences, South Albany High School will no longer have the porous campus it has today. It will no longer be open to uncontrolled access all over the place. The Albany school district has filed for a conditional use permit to allow the South renovations, and the city planning department has posted the application for public comment by March 20. The district also is asking for a waiver of the height limit on buildings in the school’s zoning district so that the planned new gymnasium can be 34 feet high. In addition, the district wants the city’s fencing standards to be adjusted to allow fences 8 feet tall. The site plan submitted by the architects, DLR Group of Portland, shows a black, vinyl-coated chain link fence all along the school on 36th Avenue, with electronically controlled gates to allow school buses to enter and leave. Elsewhere, to close off the many access points between buildings, the plan shows decorative aluminum fences, also 8 feet tall. There’s the possibility of a fence in front of the school facing Columbus Street. That one is shown on the plan between the front parking lot and the street and is listed as an “alternate.” If it’s built, it too would be 8 feet tall, and made of chain link coated in black vinyl. The idea, project manager David McKay explained to me Friday, is to make the campus less porous. The fences are to make sure that the only access to the school’s interior courtyard and buildings is through the office building in front. The addition of classrooms and the gym at South, plus the fences and related work, is part of the districtwide construction and modernization program for which voters approved $159 million in bond borrowing last year. Fences also are a big element in two of the other major projects scheduled to start this summer, the replacement of Oak Grove Elementary School in North Albany and the construction of a new grade school near Timber Ridge in the northeast part of town. At both of the new elementary schools fencing will make sure no one gets in who hasn’t been cleared through the office first. Security of school buildings is on everybody’s mind these days, as I learned when I rode the bike to South on Friday for a photo to illustrate this story. Somebody on the staff was out between buildings, talking to a police officer, and spotted me from a long way off as I was standing in front of the school with my phone. A few minutes later, Ken Fandrem of the Albany Police Department caught up with me. He had recognized me before, and I guess he just wanted to make sure. The site plan for South renovations shows an “alternate” fence along Columbus Street, left. Here we are in a modern life that is continuing to move towards a place where schools may start to resemble a low security prisons. This never happened when I was growing up, when most of us were growing up. The rest of the developed world still doesn’t look like it either. They look like what we had when we were kids. It’s your choice,folks. It’s YOUR choice. You have to decide what is most important to you. I don’t like it, and probably a lot of you don’t like it too. Only America has this problem and you know why. What would public ave as to the tennis courts look like? As well as the track and fields?? One of the best reasons I like living so close to the school is to walk of there and kick the soccer ball around with my kids and take the dog with us in the large fields. I personally think the fences would be an UGLY addition along with anpther needless waste of our money that could be put towards student programs/technology for learning. Yes it’s a sign of of the times. Sad but true. I am not surprised. Oak Grove will be demolishing it’s elementary school this summer and rebuilding .I will ask if a fence will be in their plans also. Woods wrong again. Many examples of how other countries protect schools. Think Israel with Arab and Muslim terrorists. People who want to do harm will always find a way around anti-gun laws. To be safer—be aware of your surroundings and report those who exhibit anti-social behaviors. Don’t leave it up to others to protect you/us. Harden the school place. The multiple school killings are like suicides–they act as a tipping point and encourage more. Got it Tom. You want life in America to be like living in an active war zone. I’m willing to bet that 99% of the people do not see that as achieving the American Dream. What we want is the same treatment for our children as a bag of money! Children are much more important yet you and your ilk would sacrifice them in the name of some dream! Back in the day we were much more serious on the border on speech that incites from the enemy. Schools are targets because of laws with unintentional consequences!! We do not have the luxury of rolling back years ignorant dangerous legislation! Personal experience with chain-link fence at 9 years old — it’s scalable. The proposed fence will inconvenience a determined individual but not prevent entry. Schools are supposed to be nurturing places, not gulags. Short of 12ft slick-sided walls and salley ports, how do we make a school disinteresting to an invader? “Listen to the children” is a good idea but don’t forget they are still children. They have little experience and none of the maturity that is gained only from experience in life. That’s why we don’t allow them to drive a car, vote, or make contracts until they have reached a certain age. To hear their expressions is valid, but to equate them with wisdom is even more foolish than to ignore them entirely. I think this is rediculois and missing the point. Instead of addressing mental health issues we put up fences? Are we checking back packs at the gate? As children get on the bus? I hear too many comments about the fencing around Thurston and how it looks and feels like a prison both from the inside and out. I’m sure the kids feel that way and as much as I want my kids to be safe, I don’t think this is the way. While we are on the subject, I read online that there will be March 14th student walkout. It will be interesting to read reports of any local high schools participating. 17 minute peaceful walkout where one minute per each murdered Parkland student is remembered. I wonder something, for the those with the gun fetish, why do we need military assault weapons like the AK available for purchase? As a general rule, I’d rather be more free and less safe than the other way around.